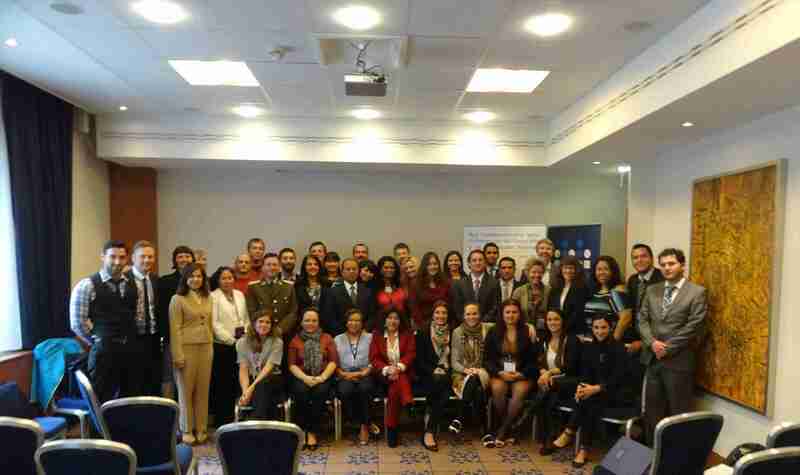 OSWIECIM, POLAND, July 30, 2013 – Sixteen member countries of the Latin American Network for Genocide and Mass Atrocity Prevention participated in the Network’s first training seminar in Poland this June. The seminar consisted of five intensive days of training in Oswiecim, where the Auschwitz concentration camp is located, including two guided visits of the camp (Auschwitz I and Birkenau). The seminar concluded with one day of training in Krakow. This seminar is one of two bi-annual training seminars of the Network that will be held in Auschwitz, Poland, as well as predetermined locations in Latin America for the next three years. The curriculum that was utilized in the inaugural seminar will serve as the training structure for all future seminars, in order to have it finalized by the end of 2015. After each seminar, member countries will provide their comments on the curriculum, which will be incorporated into a revised draft that will then be employed in the following seminar. By the end of 2015, the Network will have a final draft of this training structure, agreed upon by all member countries, which will in turn be implemented in various areas of each participating governmental institution as mandatory education for its public officials. Each state institution will implement this curriculum according to their country’s specific needs and context. Of the 18 member countries of the Network, in attendance were representatives from Bolivia, Chile, Venezuela, Colombia, Perú, México, Costa Rica, El Salvador, Paraguay, Uruguay, Brazil, Nicaragua, Guatemala, the Dominican Republic, Honduras, and Ecuador. Adama Dieng, the UN Special Advisor on the Prevention of Genocide, was also present at the training seminar. The next training seminar for the Network will take place in Buenos Aires, Argentina, on November 10-17, 2013.